Suzuki has launched a hybrid powered petrol/electric vehicle for sale on the Japanese market that travels an impressive 34 kilometres for every litre of fuel used - that's around 100mpg! The Suzuki Twin also features an automatic idling stop system shuts the engine down whenever the car stops at traffic lights or when stationary in heavy traffic, minimizing CO' emissions and fuel consumption. 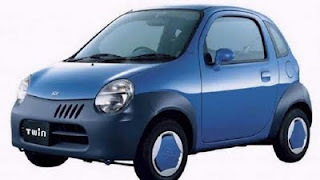 "Although immensely popular in Japan, the mini car market in Australia has not kicked off to date, but Suzuki is known for its development of unique products and niche markets so we're currently investigating whether the Australian market has a place for a hybrid vehicle such as the Twin." Suzuki Australia's General Manager (Automobiles), David Le Mottee, said.